The best video baby monitors will give you crystal clear connection without interference, and will also be adjustable, allowing you to customize your experience to suit the unique requirements of your home and child. There are a number of models on the market, but like with so many electronic appliances, it’s great to veer towards the models that are tried and true. There are a couple of models that you find again and again receive the highest rated reviews, and are praised for their performance and durability by countless parents. You love your child like nothing else in the world, but sometimes, you need some space. Those precious hours during the day when your baby is napping, and during the night when you yourself can get some shut-eye, are incredibly important. What you don’t want to experience during this special time is anxiety and constant wondering if your child is ok. A video baby monitor is designed to provide the best case scenario: your child sleeps in their crib, you can accomplish other things around the house, and all the while you can clearly see and hear what’s going on in your child’s room. There’s nothing to compare to the benefit of owning a video baby monitor, and we’ll explore some of the most popular and effective models on the market. The monitors that we will discuss share a lot in common, such as advanced features and state of the art technology that is both innovative and easy to use. But there are also many qualities that make these monitors different from one another. As you begin to look for the perfect baby monitor for your home, start by asking what your priorities are. This video baby monitor from Infant Optics is the first of its kind to have interchangeable lens technology. There are three separate lens types, including normal, wide angle, and zoom. This variety allows you to choose the most suitable focal length and viewing angle for your home, and functions just like a professional camera system. You’ll enjoy video that is streamed in real time to a compact 3.5” LCD color display that delivers crystal clear images. 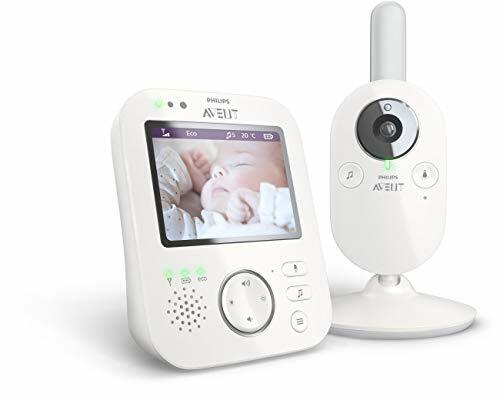 There are a number of advanced features to be enjoyed on this baby monitor such as remote camera pan/tilt, talk-back function, infrared night vision, room temperature sensor, and so much more. 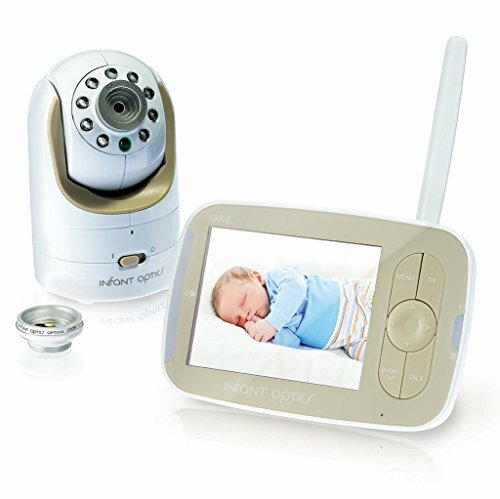 Investing in a video baby monitor is an amazing choice for the safety and peace of mind of your family, and this monitor is constructed of durable materials to ensure that it can last through a number of different childhoods. The close-up lens allows you to see your child in a more intimate scope, and it’s also possible to swap for a panoramic lens as your child becomes more mobile, allowing you to see their activities throughout the room. What the interchangeable lens system of this monitor really provides is flexibility. As your child grows, you can change the lens to accommodate their different movement patterns and actions. It’s also incredibly easy to swap out the lens in seconds. Because this monitor is so innovative, it’s one of the most popular styles on the market. The flexibility and durability that it provides is unparalleled, and even with all its wonderful features it’s still easy to use. Give yourself the peace of mind and confidence that comes from being able to see your child at all times. This is a welcome advancement to a sound baby monitor, as it allows you to have the added benefit of being able to see in crystal clear quality exactly what’s going on in your child’s room at all times. The word Avent means ‘born during Advent’, and that’s a great word to describe the durability and longevity of this product. The Avent digital baby monitor helps you to perfectly see and hear your child as they grow, adding peace of mind to your home environment. The device is specially designed with parent-friendly controls and features, including a 48 hour battery life which can be saved when you put it in power saving PEEP mode. You can also enjoy temperature monitoring, 15 ft. night vision, and a 750 ft. ClearVu digital signal. There’s also a wonderful Talk to Baby two-way intercom that allows you to communicate with your child remotely. The powerful invisible night vision LEDs allow you to view your child even in complete darkness, and the monitor also features 3 soft lullabies to relax your baby. This monitor is designed for convenience, keeping you from having to recharge the battery for 48 hours. Also, when there is no sound in the baby’s room the monitor will automatically go into power reserve mode. Once your child makes their first ‘peep’, the monitor will instantly restore to full power. The compact 3.5” screen delivers you images in crystal clear clarity, whether night or day. The sound quality on this monitor is also superior, immediately alerting you when your child is becoming fussy and making noise. There’s nothing that makes a baby more uncomfortable than an environment that is not an ideal temperature. That’s why the temperature monitoring system on this device is so useful. Studies show that a baby’s room should be between 68˚ to 71˚ F, and this feature allows you to be alerted when the temperate strays from this ideal window. All in all, this system is absolutely packed with features that put your mind at ease, no matter what age your child is. Zebora is a name that parents can trust, and Zebora is one of the most popular baby monitors on the market thanks to advanced features such as pan/tilt/zoom options and its wireless construction. Perfect for monitoring your baby, it can also be used in the home to monitor pets or elderly parents. The device is designed to give you the peace of mind of knowing you can monitor your child no matter where you are in your house. Experience professional quality images and sound transmission equipped with 2.4 GHz wireless FHSS communication. That means interference free transmission when you need it most. The device comes with non-visible IR LEDs for exceptional night vision, as well as a temperature monitor, auto-power off with VOX activation feature, and rechargeable lithium-ion battery operated 3.5” LCD monitor. The monitor is also portable, allowing you to place it wherever you need it, providing hours of mobile use while you freely move about your home. You can even monitor outdoors at a distance of 980 feet without any sign of obstruction. You should keep in mind that this system is also expandable to up to 4 camera units that all can be viewed from the single LCD monitor. Enjoy extra features such as feeding timer, room temperature monitor, and built in clock. The entire system is backed by a useful 1 year warranty in the event that the camera or monitor need to be replaced. With all these amazing features you’ll find that this monitor is an asset to your home, and can be used for a number of different applications. Experience the peace of mind and empowerment that you feel when you can move about your home freely, while still being able to effectively monitor your child. These video baby monitors are the most tried and true that you can find on the market, and manufactured by the brands that parents trust most. They share common features in common such as crystal clear images and sound, as well as ease of use and good operating range. Whether you purchase multiple receivers or multiple cameras, you’ll find that these systems provide the range of features that you require at a price that you can afford. That being said, there are plenty of fish in the sea, and countless other models of video baby monitor should these not be appropriate for you. Go online and start reading other reviews for yourself to see if there’s an even better option out there to suit your unique requirements. No doubt you will easily be able to find the right model for you with a bit of research and time. Next, we’ll delve more deeply into the various features and specifications that are available. Before purchasing any electronic device, it’s always best to know about the product that you’re buying. Give yourself a good idea of how these monitors work, what benefits they’re meant to provide, and pitfalls you may encounter when operating one. Not all baby monitors are the same, and you truly do get what you pay for. So, understand before you pull out your credit card exactly what it is you’re paying for, and how best to use and maintain the device. We all know that having a child is an amazing, and sometimes exhausting, experience. No matter how much you’re in love with your child, you do look forward to those hours when they are napping so that you can get things done around the house and catch up with other aspects of your life. No matter what age your child, these hours are important, and you desire a way to get things done while still being able to see and hear your child. 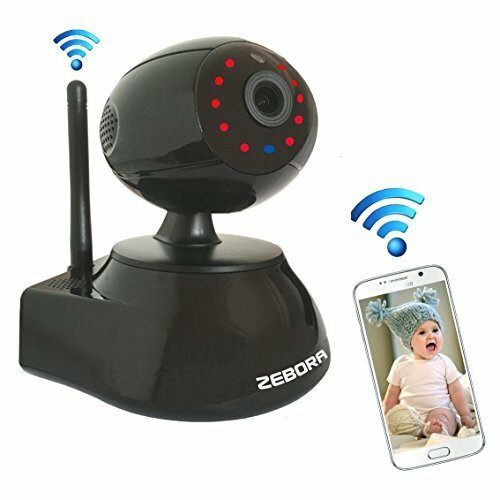 A high quality video baby monitor, such as the ones mentioned above, give you this freedom to roam around your house and still be able to stay in contact with your child. There are tons of monitors on the market, and particularly with a video baby monitor you may be daunted by which one you should choose. Before you begin your search, it’s important to look into what features and qualities make a good baby monitor into a great baby monitor. Once you do your homework and know a bit more about these remarkable devices you’ll be better suited to making a decision that will truly benefit your whole household. Lets begin with a bit of background knowledge before we delve into purchasing points. Traditionally, parents would put their children down for a nap during the day and go about the house, doing their business. Then they’d put the child to sleep at night and would be awakened by crying or sounds in their baby’s room. Parents would leave the door open to better hear their baby’s call in the night. Hearing and responding to their baby was simpler then, and homes were also smaller. That being said, the need to monitor one’s child has always been important, and Fisher Price realized that back in the 1930s. Baby monitors didn’t become a household necessity until some 50 years after the most basic monitors were created. Today, due to our hectic lives and larger homes, you will be hard pressed to find any house where there is an infant that does not have a baby monitor. The benefits of this device are simply too great in number for any parent to deny. Before you purchase and set up your baby monitor it’s a good idea to learn the basic functions and the types of monitors that you will find on the market today. Once you know this you’ll be better able to select a unit that is right for you and set it up properly. Traditional baby monitors are also known as baby alarms, and they operate on a radio frequency similar to what you find with a walkie talkie. These traditional baby monitors come with two different parts, the first being the base or transmitter which is placed in the baby’s room. This unit has a microphone which transmits the sound that the baby makes via radio waves to the parent monitor. The monitor, or receiver, is the second component to the system, and it is generally carried around by the parent or caregiver, allowing them to monitor the child from a distance. Traditional: Originally the only baby monitors that were available were the one-way units that transmitted sound alone. These are still the most widely available systems but are by no means the most advanced or efficient. Wireless: Today you come across the latest innovations that allow for wireless connectivity, providing the parent with freer movement and better sound quality. Intercom: Also, you’ll find two-way radio options which allow you to talk to your child, as opposed to just hearing their sounds. Video: As we have highlighted above, the very best technology that you can find today also includes video monitoring for the ultimate connection to your child. Placement of the Transmitter is Important: In most cases the transmitter end of the baby monitor will require a wall plug for operation. That means that wherever you plug the transmitter in you need to make sure that it works properly in that spot. Hearing and viewing your child accurately will depend upon where the transmitter is set up, and for sound, this usually means 5 to 10 feet within reach of the crib. Make Sure You have the Appropriate Receiver: The sensitivity of the receiver is going to vary from model to model, so it’s important that parents consider what activities they will probably be doing while their child is napping, and where these activities will be located. Some of these receivers will come with belt clips, whilst other systems provide multiple receivers that you place in various rooms throughout the house. Some will even vibrate when the sound coming from their child’s room reaches a certain intensity. Evaluate for yourself which kind of receiver you’re most interested in. Be Knowledgeable About Frequency Interference: You must know which radio frequency a monitor operates on. The frequency category that you purchase should depend upon where your family lives and what other electronic devices are being used in the home. Even if the frequency is not readily apparent the manufacturer’s website will fill in the details. When you have this knowledge about your monitor you’ll be better able to use it properly and get the most of it without interference. Number of Receivers: It’s often convenient to own more than one receiver. This allows parents to keep one receiver in the master bedroom while carrying the other one on your person around the home. Location of Charging Stations: Decide where is the most convenient location to charge the receivers. When to Use the Monitor: Dependent upon how your home is laid out, you may not need to monitor your child during naps. Also, deep sleeping parents will want to use a monitor to hear a baby at night. It’s easy to purchase a video baby monitor because there are so many to choose from on the market, but this variety can also make the decision daunting. You’ll find devices at any major department store or retailer with baby products for sale. You should be able to find the popular models discussed above either online or in one of the aforementioned stores. The latest models can also be found in boutique baby stores and even electronics retailers which offer higher-level models. Before you set out to purchase, be sure to understand how much you’re willing to spend on your video baby monitor, what kind of warranty you’d like, and what quality level of camera you’re hoping to have. Is there anything that can be considered the “best” video baby monitor? In reality, there are some that are of the highest quality, but it really comes down to taste. No one wants a second-rate baby video monitor for their child. You’ll be happy to know that with all the features available on today’s market it’s possible for you to customize certain applications to suit the needs of your home and your baby. It’s possible to find the plethora of options to be bewildering, especially with all the bizarre technological terms that you read in the specifications for the cameras. For instance, what’s the difference between the analog and digital monitor? What’s a voice operated transmitter? Also, how can one customize their camera to best suit their home? Even if you aren’t a technological genius, you can mix and match the features that you’re comfortable with to create the perfect system for your home. Some of the options mentioned above are important, whereas others may not be necessary for you. Keep in mind that any video baby monitor that does not have IR night vision is pretty much useless. Being able to see your baby at night is one of the key advantages to owning a video monitor in the first place. Something else you’ll probably find useful is the low power indicator. It’s vital that you are notified when it’s time to charge the battery so that your baby does not go unmonitored for hours without knowing about it. You should note that when you live in a densely populated urban area you’re going to want a digital monitor that uses encrypting technology. This is because an analog video monitor is prone to intercepting signals from other devices that use analog signals. Parents are smart to consider brand quality when they’re looking for a high quality video baby monitor. The most basic manufacturers will provide a comprehensive package that includes cameras, transmitters, receivers, and the like, but the most popular brands will include added features such as advanced audio and visual specifications and capabilities, as well as enhanced product design and customer support. The best cameras will work well within a number of different lighting conditions, and they have a two-way parent talkback feature to soothe and assure your baby when you’re in another room. They also have out of range indicators and brightness/contrast controls. Owning a video baby monitor is one of the best ways to stay connected with your child throughout the day and night, while still allowing you the freedom to move around your home and accomplish tasks. Although operating a video baby monitor may seem complicated, it is in fact incredibly easy and most systems are designed to be user friendly. When looking for the right monitor for your home, consider how much you’d like to spend, how many receivers you need, and what features are most important for your home. There are countless video baby monitors on the market, and it’s easier than ever to find the right one in a local store or online. We explored some of the most popular and trusted models on the market, but if none of these are what you’re looking for, be sure to do your homework online and read certified reviews to find a system that has been vetted by parents. No matter what model you choose, you’ll find that operating a baby monitor adds so much to the safety and sanity of your home. As a parent, you know that nothing is more important than your child, but you still have an adult life to tend to. Owning a high quality video baby monitor will allow you to multi-task in an ever increasingly fast paced world. Whether it’s working in the kitchen, out in the garden, or inviting friends over, you’ll find that you can do all of this while your baby is sleeping, and still be able to get to their room quickly when there’s any sign of disturbance. This not only puts you at ease, but it’s also comforting for your child to know that you’ll be right there when they need you.